Since our grand opening in 1984, Hilton Sandestin Beach Golf Resort & Spa has expanded, evolved and thrived. But certain things remain true to our core — values and amenities that built the foundation of our Florida beachfront resort experience. Those staples are still part of our property and our identity today. 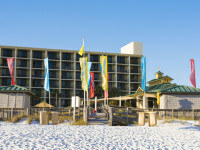 Hilton Sandestin Beach is first and foremost a Florida beachfront resort. Our property still sits on its original location on the Gulf of Mexico. With beautiful white sand and emerald water, the beach is a major attraction for all of our guests. Kids of all ages love to splash in the waves, adventurers can set out on kayaks or YOLO boards and families can come together for a moment of solitude as they watch a sunset together over the Gulf. 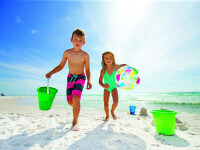 Speaking of family, Hilton Sandestin Beach has always been a sought after location for a family vacation. Multi-generational trips are easy and enjoyable at Hilton Sandestin Beach because our resort in Florida truly does have something for everyone. We’re proud to say that many families have visited Hilton Sandestin Beach multiple times throughout our over 30 year history. We’re honored to be a valued tradition among many families. We love the opportunity to see children grow up before our very eyes, and bring their own kids back to our property later in life. Families aren’t the only ones who love Hilton Sandestin Beach. Our Florida resort location is the ultimate dream for many brides and grooms who always wanted to get married on the beach — and for meeting planners who organize conferences and events on our property all year round. Though our meeting spaces and ballrooms have grown and evolved, our commitment to top-notch beach weddings and meetings remains the same today as it was over 30 years ago. Destin and Sandestin, Florida have always been popular vacation destinations — and Hilton Sandestin Beach has always been close to the action! We’re located just a few miles from the area’s best shopping and entertainment. Our proximity to great entertainment is part of the Hilton Sandestin Beach experience, and as more stores, restaurants and more are built around the area, we’ve integrated amenities to help our guests enjoy it all. With a shuttle that brings guests to and from The Village of Baytowne Wharf exclusive shopping passes for nearby outlets and more — Hilton Sandestin Beach offers guests a full set of entertainment options during their stay. Each member of the Hilton Sandestin Beach team — from our owners to our wedding planners, concierge and more — is committed to providing you with the best on-property experience possible. From the moment you check in to long after you leave, you are part of our Hilton Sandestin Beach family. Our property was opened to expose people to the beauty of Sandestin, Florida and help families, friends, coworkers and more build memories to last a lifetime. Today, we still aim to do just that. 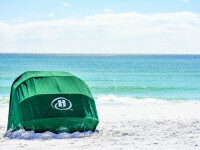 Visit our beachfront resort in Sandestin, Florida today and experience it for yourself!